Bike Polo Age Article, originally uploaded by urbanbicyclist. 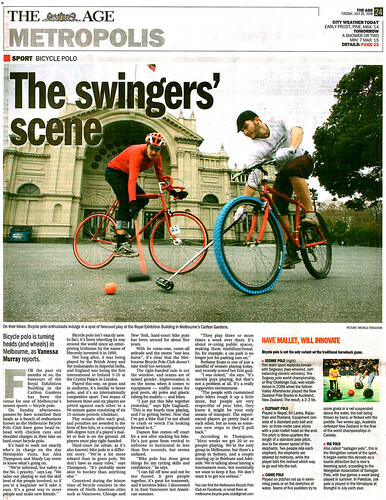 A news story about hard-court bicycle polo from Melbourne paper The Age. I found this on Flickr. Follow the link to a readable size. Over all this is a pretty good story in my opinion, plenty of real-estate, good photo, listing this as a “sport”, siting Vancouver, Chicago and New York and only using the word “urban” in parenthesis after calling the sport “hard-court bike polo”. And it seems that a few different cities play in Australia. Keep it up down there. It cracks me up that in the side notes to the article they talk about the Segway Polo World Championship final. The Silicon Aftershocks Vs. New Zealand Pole Blacks resulted in a 2-2 tie!?! That would never happen in bike polo. This entry was posted by Doug D on July 30, 2008 at 6:30 pm, and is filled under Australasia, Bike Polo, Media/Press. Follow any responses to this post through RSS 2.0. You can leave a response or trackback from your own site. I’m hoping there will be exhibition “Yak Polo” at Los Marcos. I’m bringing my yak, just in case. They also failed to mention in the elephant polo breakout that the game also features ‘ball boys’ who dash onto the field to remove elephant excreta to avoid it becoming airborne during play.